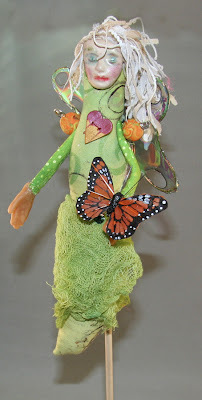 Adventures in doll making, mixed-media art, knitting, crocheting, fabric art, quilting, polymer clay, and whatever else strikes my fancy. After waiting patiently nine months (not) for my studio to be carved out of the gigantic basement in our new home, I'm thrilled that it is finally finished. 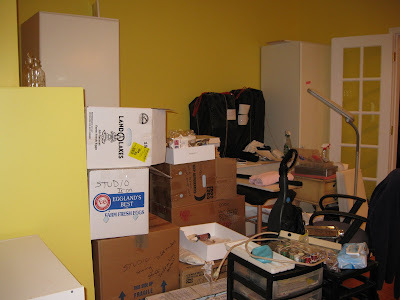 This is what the basement looked like the day before we moved in when it was turned it into a huge storage space for 170 boxes of my precious junque. After the movers left, the basement looked like this. Yikes! 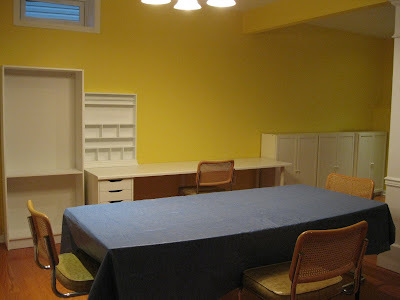 The contractor finished up last week and since then Howie and I have been setting up the cabinets and worktables. Thank goodness for IKEA. This is the same view as the first picture. 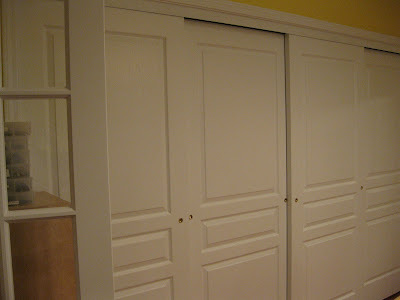 The French doors at the end of the hall lead to the studio. 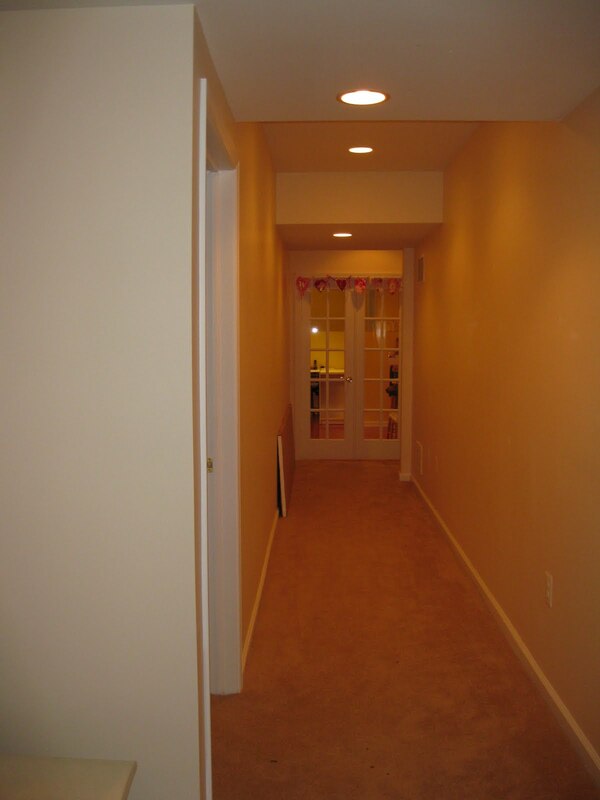 The door that you see on the left leads to Howie's "Man Cave." The "Welcome" banner was a special gift from my good friend Kathy McElroy. Kathy sent this to me just after we moved in and I've been waiting to put it up until the studio was finished. Today was the day! I felt as if I was christening a ship with a bottle of champagne when I tacked it up. It's now official. The studio is open and welcomes all kindred spirits who wish to come and "art" with me. As you enter the studio, on the left is a wall of doors. 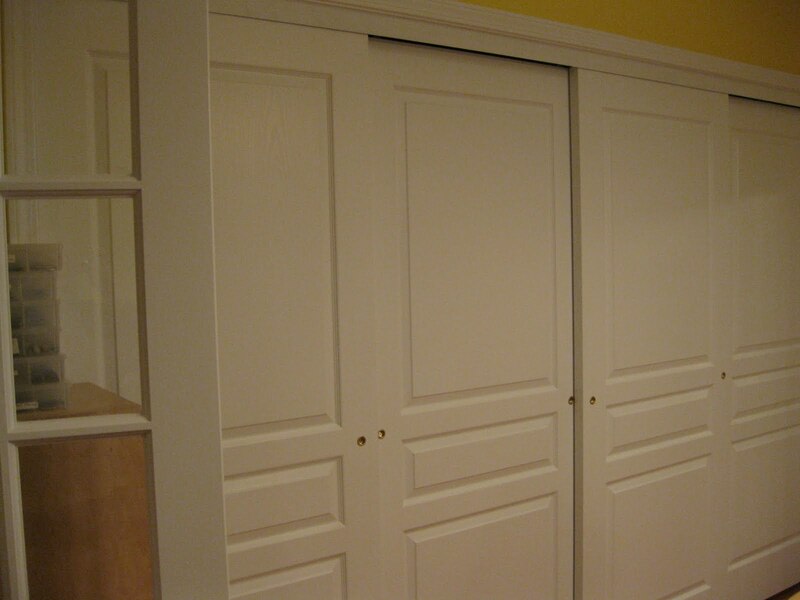 What's behind the doors? Lots and lots of glorious shelf space soon to filled with what's been residing in the 170 boxes. Of course, I know it all won't fit in the space I have so I will have to be creative and find some good hiding spaces for the overflow. The picture above is the left wall of the studio as you enter. Look how clean and neat it is! It won't be for long. 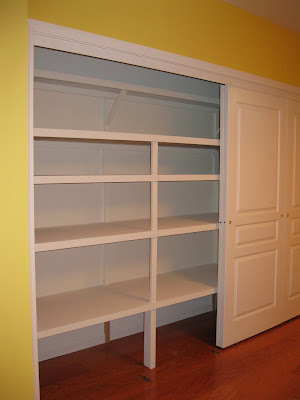 I'm going to use this area for sewing and paper crafts since most of the supplies for that will be housed in the big closet. The table in the middle of the room (with the blue tablecloth) will be a great place to sit and create when then there is more than one person working in the studio. 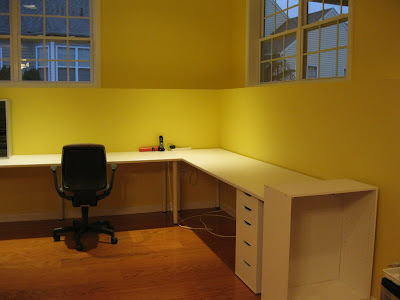 This is a view of the far wall with another workspace. 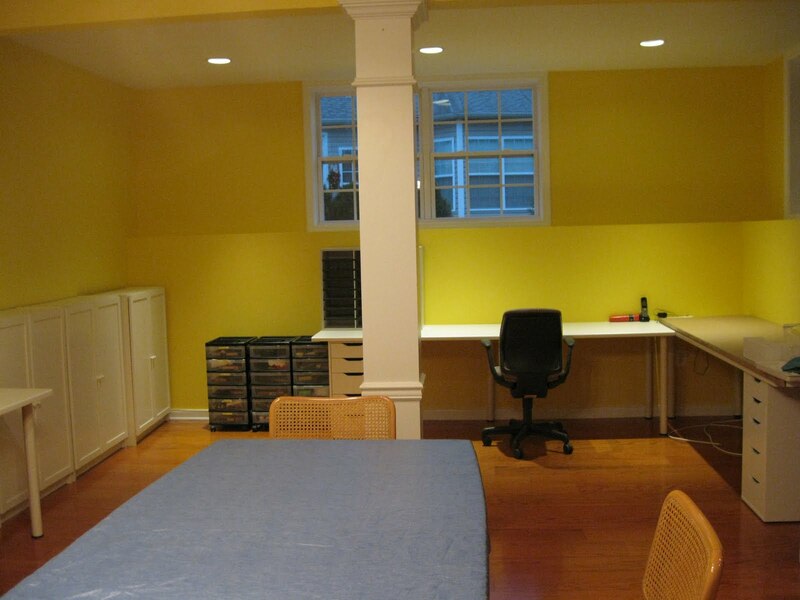 I'm planning on using this area for my polymer clay and jewelry projects. Moving around to the right is another surface soon to be cluttered up. This is where my computer is going. 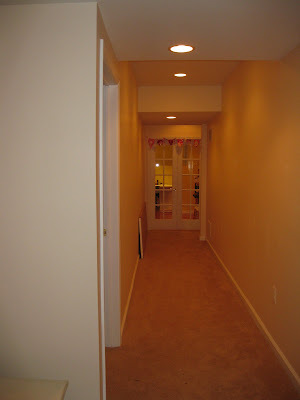 And last but not least, this is the area to the right of the door when you enter the room. Yes, it's already filled with boxes of junque waiting to be unpacked. When this area is unpacked, Howie is going to put in cabinets, a counter top and a sink. No more running back and forth to the kitchen or bathroom to wash out brushes. 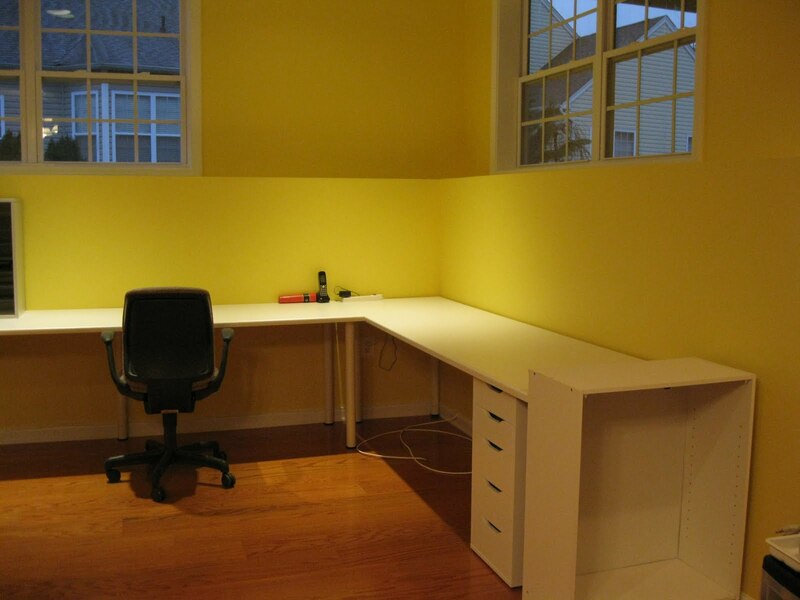 You'll notice that I chose Daffodil Yellow for the walls of the studio. I had a hard time trying to pick a color that worked for me. For some reason, I kept gravitating towards yellow. Thank goodness that you can now audition a color by buying a small sample from the paint store because the first yellow I tried looked horrific. When I tried this one, it was love at first sight. It was only after the room was painted and I looked around that I realized that this was the same color as my mother's kitchen when I was growing up. My mother's kitchen was always a happy place for me, and I guess that subconsciously when I was choosing a color this yellow made me the happiest. I'd love to have you come and join me in the studio. So when are you coming? If "A Picture is Worth a Thousand Words," I guess this blog is worth 8,000 words. Here are 8 pictures of our new house. I know the house looks small, but it actually is very big. 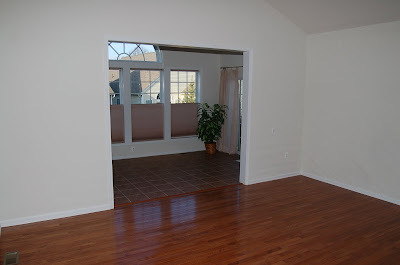 The main level has a Living Room-Dining Room which I am hoping to convert into one large Dining Room. Since we have a Family Room, I don't think we need a formal Living Room but I do love having a Dining Room where everyone isn't cramped around the table. 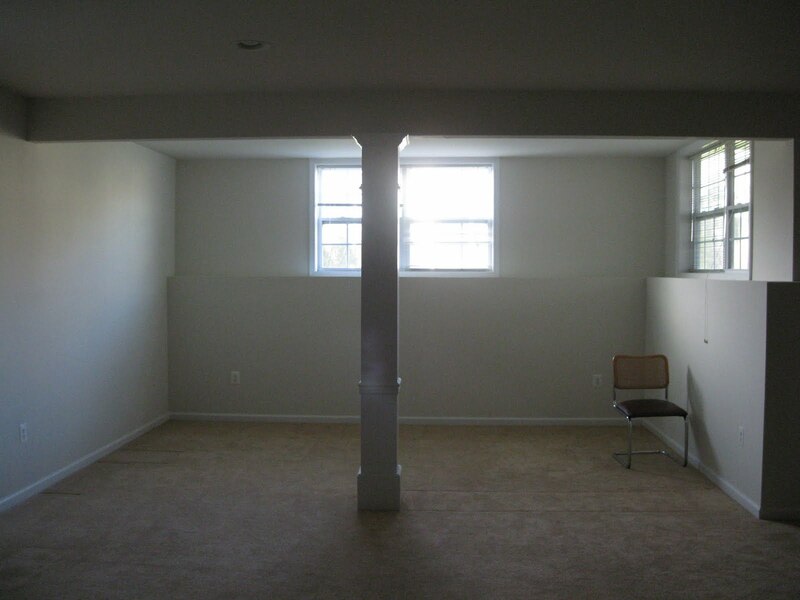 The challenge is that there is a ceiling beam separating the LR from the DR and we need to disguise the fact that the room was intended to be two separate areas. 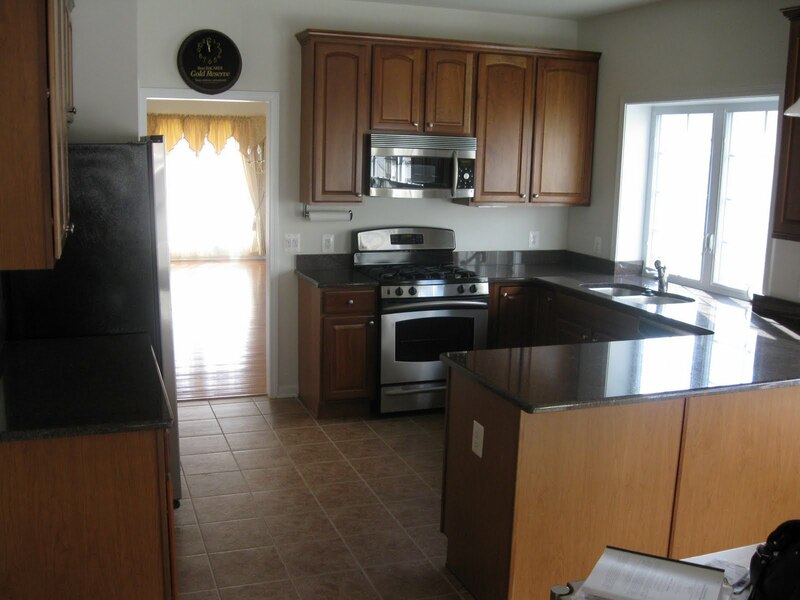 In addition, there is a large Kitchen with eating area. The cabinets are so tall that even Howie can't reach the top shelves! You can see the LR/DR through the door. Here's a view from the Family Room looking into the Sun Room. I love the Sun Room! 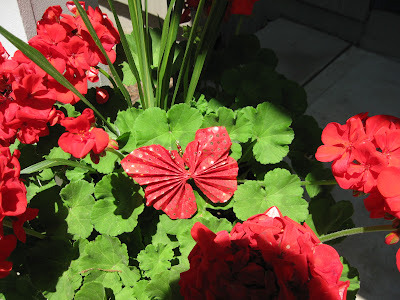 It makes the house look so bright and cheerful on a sunny day. Too bad we haven't had too many of those lately. There is also a Master Bedroom and Bath on the main level as well as smaller bedroom and guest bath. We had two criteria when we decided to look for a new home. One was to be closer to our grandchildren and the second was that the house had to have a basement so that Howie and I could have space for our hobbies. We used to live an hour from our son's house and now we're 15 minutes away so we accomplished that goal. However, finding a home in an over 55-adult community with a basement was a challenge. Most people want to downsize when they get to this point of their lives. 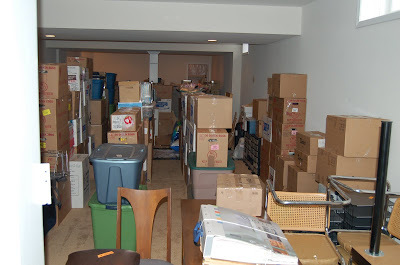 Obviously we didn't downsize at all since we bought a house that had a huge, and I mean huge, basement. It's the same size as the main level. 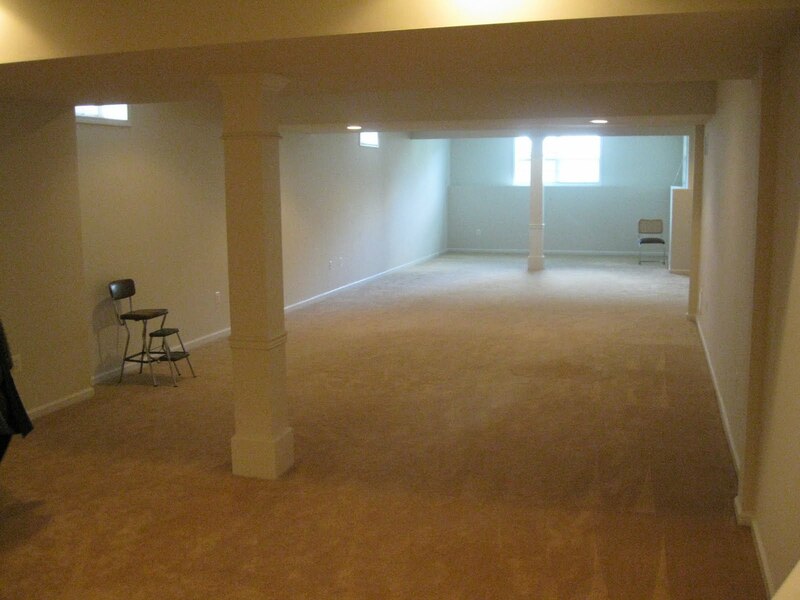 Here's a picture of the finished section of the basement. It's 60 feet (that's not a typo) by 16 feet!!! I'm going to have a wall built at the far end to make that area into the studio. It's the area with the largest windows. This is the area where the studio will be located. 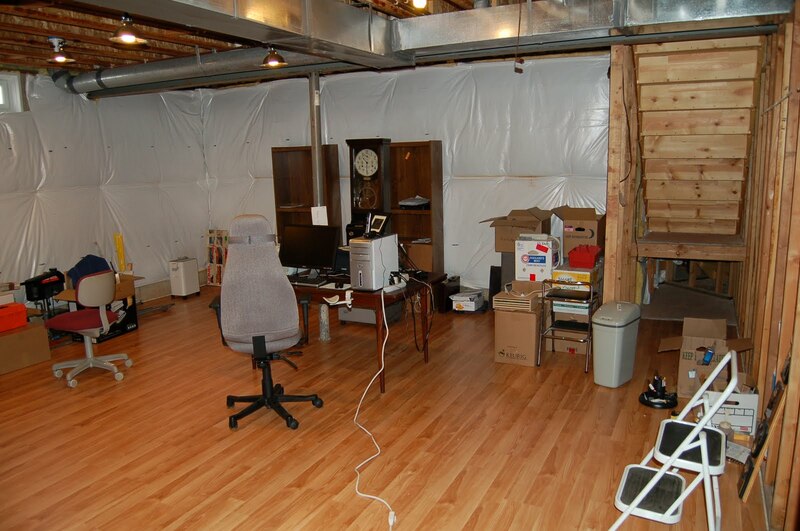 In addition to the large finished area, there is an partially finished area which Howie is going to have split into two rooms. One will be his man-cave/office and the other will be his workshop. Here's what it looks like currently. We're not done yet. 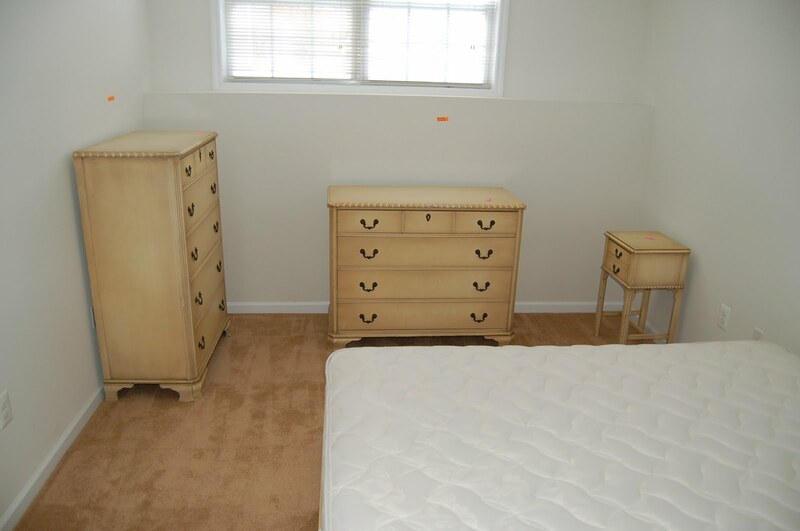 There is also another large guest bedroom and bath in the basement. 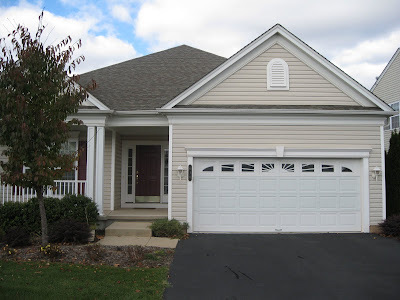 It has large windows so it doesn't feel like a basement. Have you ever wished you could take an ordinary photograph and turn it into an extraordinary and artistic photograph? I know I have. I've always wished I could use Photoshop to enhance my art projects but I didn't have a clue how to go about learning it. 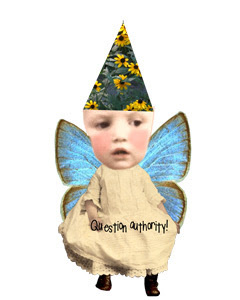 I bought Photoshop Elements hoping to learn how to use it on my own. Let's just say that I failed dismally. This class starts January 4th and runs through February 1st. 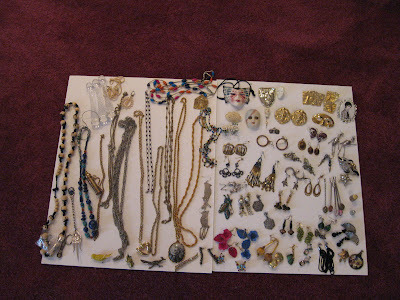 Several months ago, I joined a Bead Swap with my some of my online Diva pals. The intent was for each person to make a bead between 1/2 inch and 1 1/4 inches. After the beads were exchanged, we were to connect them to a chain. 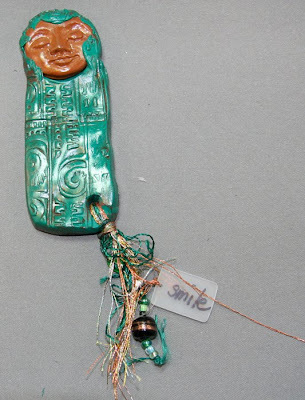 Each person was to make a bead that represented themselves so that when we looked at our collection of beads, we would be reminded of the artist who made the bead. I never realized how hard it would be to represent myself as a bead. I am not exactly sure this bead epitomizes me since I'm not round and sparkly, nor am I golden, but this is what my muse dictated that I create. 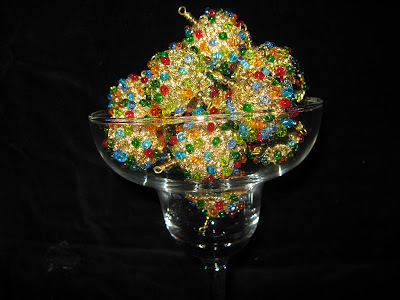 I crocheted my beads using several strands of gold embroidery thread. When the bead was almost completed, I stuffed it with batting and then finished off the bottom of the bead. The hardest part was getting the wire through the batting in order to make the wire wraps on each end. Then I glued seed beads on to the surface. I tried sewing on the beads, but it was very tedious. I found that gluing the beads on with Diamond Glaze worked perfectly and was much faster. This afternoon, I strung the beads on a chain. 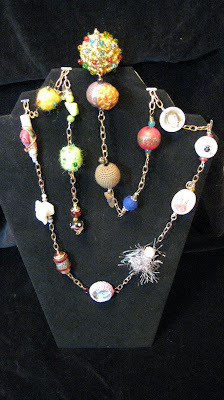 It makes a lovely necklace, but probably unwearable due to the weight of the beads. 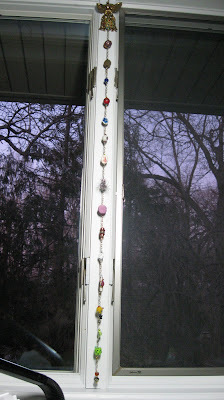 Therefore, I decided to leave my chain long and to hang it between the windows in my studio. Now whenever I'm working on my computer or working on a project, all I have to do is look up and I'll be reminded of some of the nicest people I know. One of the nicest things about this location for the chain is that it is the first thing I see when I walk into my studio. Where has the last six weeks gone since the last time I posted? I've been busy visiting with my very good friend, Kathy, altering keys, altering a birdhouse and celebrating my hubby's VBB (Very Big Birthday). Oh, and of course, going to garage and rummage sales. Once the kids go back to school in September, there is a deluge of these sales here in NJ. Everyone is rushing to get things sold before the cold weather arrives. Kathy hails from Tennessee and is a world traveler. However, she had never been to NYC until last month. 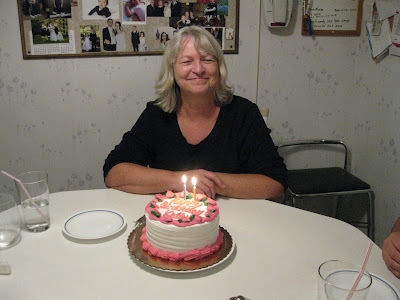 As part of her birthday celebration, Kathy came to visit and we had a total blast. 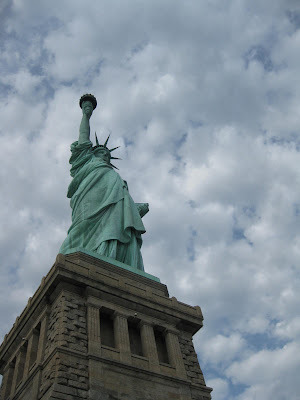 One day, we visited The Statue of Liberty and Ellis Island. It was an awesome day and we had fun researching Kathy's ancestors to see if they came through Ellis Island. Kathy gifted me with the most fabulous fabric book that she made. Pictures just can't do this book justice. 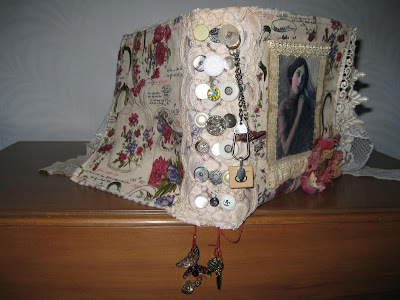 As you can see from the above picture, the spine is decorated with vintage buttons and charms and the cover is embellished with a photo printed on fabric, lace and a button flower. 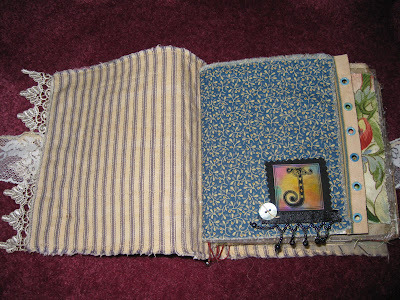 The inside pages are made of fabric, vintage papers, and some of Kathy's beautifully painted pages. This book is breathtaking and I know just what I'm going to do with it. However, you'll have to wait to find out. On another day, we visited the Garment District in NYC. We had a wonderful day exploring my favorite stores which you can read about here. Of course, the Garment District isn't the only place to acquire really amazing embellishments and art supplies. NJ garage sales offer a wealth of possibilities as witnessed by the picture below. Yes, all of this came from one sale! Are you wondering what I do with all this junque? During one of the days that Kathy was here, another friend, Santa, joined us and we decided to alter keys. Making altered keys has got to be one of the most fun projects I've done in a long time. 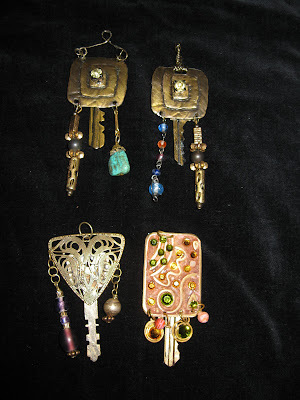 Using old keys and pieces from my odd assortment of junque jewelry, we had a laugh-filled day eating, talking, sharing and arting. 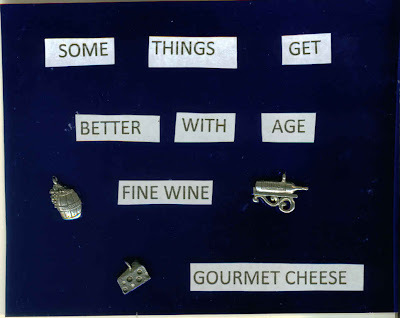 If you'd like to read the article that inspired me to make these keys, go here. I plan on using my keys as pendants. 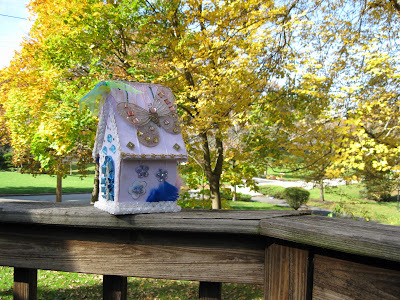 On Kathy's last day here in NJ, I altered a birdhouse. 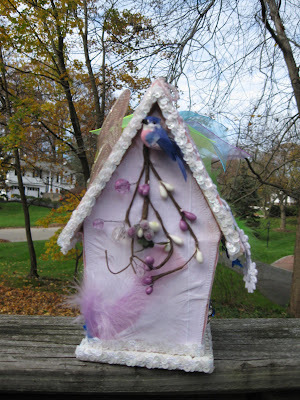 I had seen a picture of a birdhouse that Kathy had altered and was dying to try it. With her encouragement, I went ahead and had a go at it. 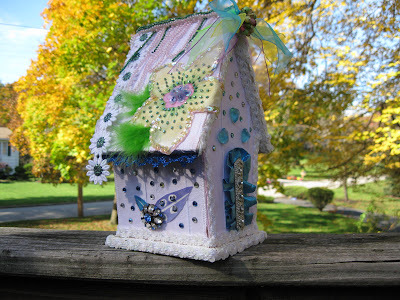 If you'd like to see my inspiration for altering birdhouses, visit Kathy's blog here. As you can see, Kathy's gorgeous birdhouse is vintagey. I was aiming for vintagey but somehow my muse had other ideas. It seems she was in a glitzy mood that day hence the lace, sequins and ribbons. One last thing, in addition to the beautiful fabric book Kathy made for me, just look at this fantastic wire mannequin she squeezed into her suitcase. 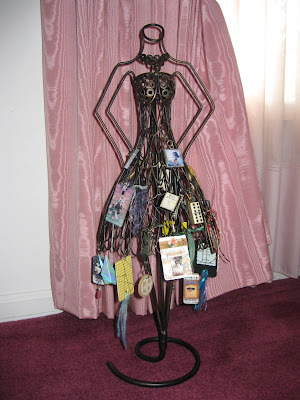 I had been looking for something just like this to display charms that I have gotten in various swaps and it seems that a little birdie told this to Kathy. 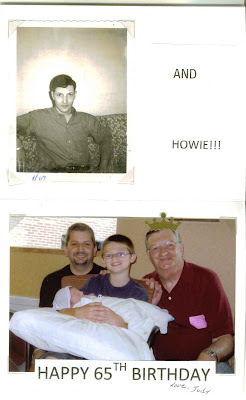 On a family note, last month Howie celebrated his 65th birthday! It's hard to believe that young guy I married 42 years ago is now an official senior citizen. Here's a picture of him opening one of the gifts I gave him. 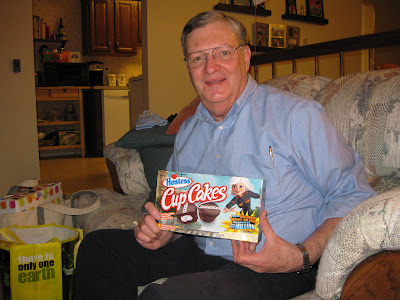 Yes, it's Hostess Cup Cakes. I was trying to help him re-live his childhood. Don't you just love these Art Dolls? And what about these Fabric Pocket Dolls? Is there a clay goddess in your future? Or perhaps you need a crown for your coronation? 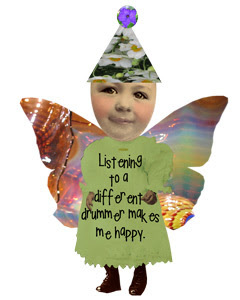 Please check out Joanne's web site. The eye candy is fabulous and I guarantee it's not fattening. I'm still obsessed with fabric beads. This is very odd since I usually spend a few days working on something and then go on to another project. Perhaps it's because I was presented with a challenge that I couldn't resist. There is nothing I like more than a challenge. The other day, one of my online friends, Shauna, mentioned that she had tried making fabric beads following directions she had read on the Internet. She was quite frustrated since her results were less than stellar. 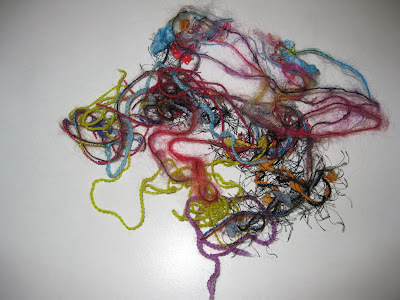 The technique involved taking scraps of material, fibers, threads, etc. and washing the collection in the washing machine or by hand and then drying everything in the dryer where the material/fibers would get tangled. 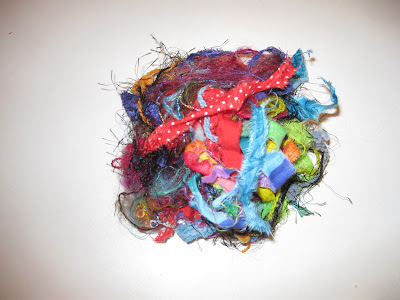 The instructions then said to take a small amount of the tangled material, roll into a small, tight ball, pin in place to hold everything together, and then stitch the material until a tight bead was formed. 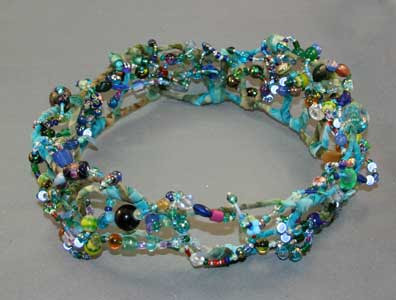 Once this was done, the bead could be embellished with seed beads. 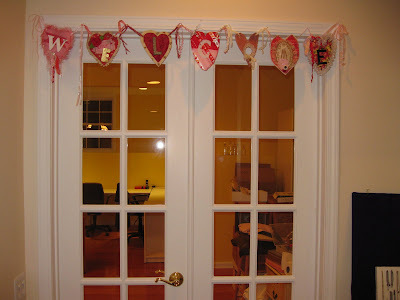 After following the directions, Shauna lamented, "My material didn't clump up. It just made a mess in the washer." I felt badly for her, and since I was stuck in the house while Hurricane Bill deluged northern NJ with rain, I decided to try my hand at this technique. 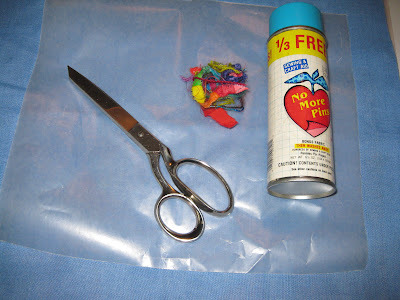 Here is my simplified version of how to make beads from scraps of fabric and thread. I like "simple" don't you? I also like to recycle. It makes me feel patriotic and noble. I'm not adding to the landfill. I'm not increasing my carbon footprint. I'm creating something from nothing. Oh what a good girl am I! I decided to bypass the washing and drying steps. First of all, it saved time. Second of all, it saved water and electricity. I'm getting greener and greener by the moment. 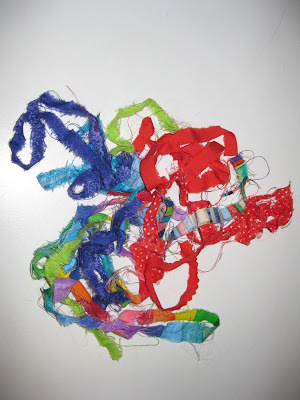 The goal of the washing and drying step was to get a tangled mess of frayed fabric. I accomplished this by cutting some odds and ends of fancy fibers into 12 inch pieces. and then roll the whole thing up into a ball. 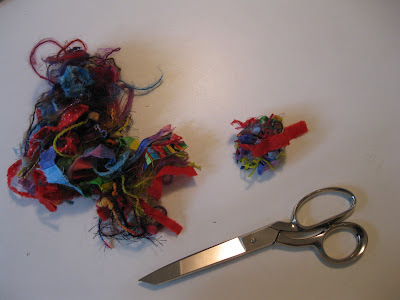 Next, cut off a small amount from the fabric/fiber ball. Rather than pinning the fabric/fiber into a bead shape, I used a temporary adhesive spray (used by quilters to hold paper pattern pieces to fabric) which did a lovely job of holding the fabric pieces together while I formed the ball. Note: It didn't make the fabric sticky as I had feared. Knowing that I would need to attach my bead to a chain using a jump ring, I inserted a wire through the material before I stitched the bead. 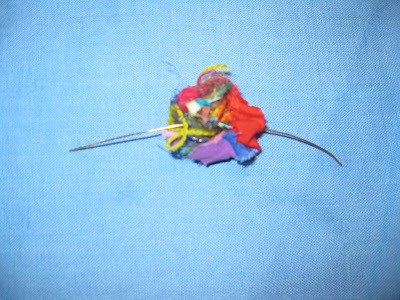 Once the bead was tightly sewn together, it would have been impossible to get the wire through the bead. I am so proud of myself for having figured this out before I made my bead. 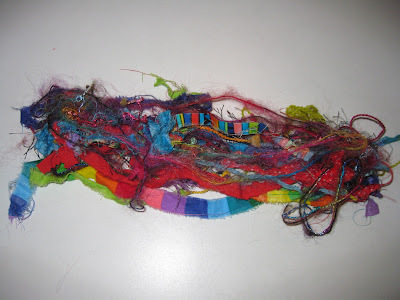 Working my way around the bead, I used colored thread to stitch the strips of material tightly together. This way if my stitches showed, I could claim it was part of the design. 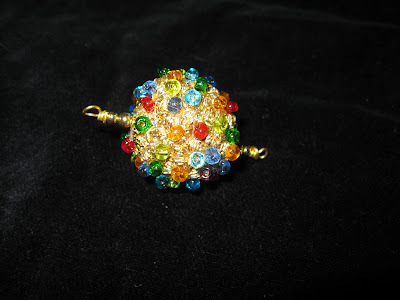 After the bead was stitched tightly, I had fun embellishing the bead. 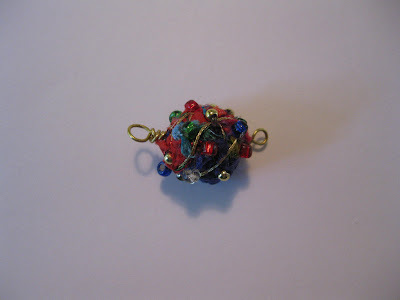 I used metallic threads of various colors which I wrapped around and stitched through the bead. I finished up by sewing small beads all around the bead. I have to admit, it was a labor-intensive project and took a couple of hours, but the results were worth it. And I have the satisfaction of having met the challenge.